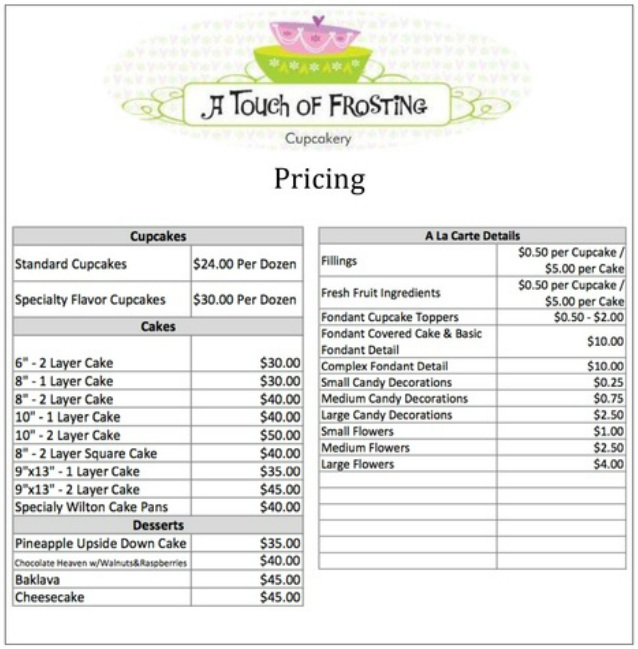 Price Guide - Add a Little Frosting to Your Life! The price guide below will help to get an idea of a price range. For a detailed price quote, please contact us! Pricing Updated as of July 17, 2012. Please note prices above are base prices to help get an idea of a price range. For detailed pricing please contact me, I will be happy to discuss with you all the details of your cake creations and provide a detailed quote. Tiered cakes are priced based on details and difficulty. You must contact me for a quote. All orders are subject to a deposit. Please see Ordering/Payment for details.